In the last decade, observers of Western governments have become increasingly concerned about an apparent crisis of democracy. They argue that endemic corruption, inadequate services, and increasing voter disaffection have produced a dire result: a global resurgence of authoritarianism. 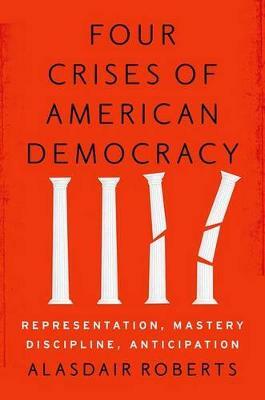 The political climate surrounding the 2016 presidential election in the United States has only reinforced the perception of democratic crisis.In Four Crises of American Democracy, Alasdair Roberts locates the U.S.'s recent bout of democratic malaise in a larger context, arguing that it is the latest in a series of very different crises that have plagued America throughout the entire post-Civil War era. He focuses on four crises, describing the features of each and outlining solutions the government adopted in response. The first crisis-the "crisis of representation"-occurred in the late nineteenth and early twentieth centuries, and was dominated by fears of plutocracy and debates about the rights of African Americans, women, and immigrants. The "crisis of mastery" spanned the years 1917-1948, and focused on building administrative capabilities so that government could better manage both an increasingly complex economy and volatile international system. The "crisis of discipline," beginning in the 1970s, was triggered by the perception that voters and special interests were overloading governments with unreasonable demands, and the response was to limit government's reach. The current crisis, what Roberts calls the "crisis of anticipation," is ongoing. Roberts pronounces it a future-oriented crisis, preoccupied with the capacity of democratic systems to deal with long-term problems such the rise of China and climate change. Roberts suggests that democratic solutions to this present crisis will win out over more authoritarian ones, as occurred in previous crises. Features like societal openness and pragmatism give the democratic model a distinct advantage. A powerful account of how successive crises have shaped American democracy, this is essential reading for anyone interested in the forces driving the current democratic malaise both in the U.S. and around the world.